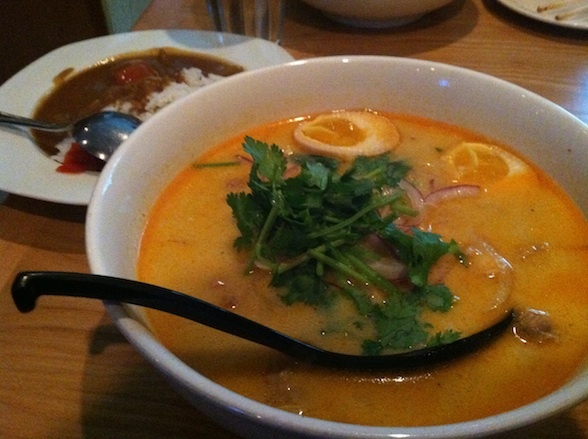 We hit up this fairly-new midtown ramen spot last week for a quick dinner. There was no line when we arrived and we were brought to a table in the back right away. I ordered the Tabata ramen with a coconut milk base and chicken and Charlie went for the spicy sesame Tan Tan Men with ground pork. We shared gyoza and curry rice. The gyoza came first and were caringly homemade with thin, translucent skins and juicy filling. They were browned to a perfect crisp on the bottom and sticky steamed all around. The standouts in my soup were the silky coconut broth, the flavored egg and fresh cilantro. The egg was melt-in-mouth salty sweet delicious. The chicken was good but not very memorable. The curry rice was in a typical brown Japanese curry sauce. Tabata is a good Ramen option for Midtown, especially for when I don't want to wait on line at Totto. I would go again.